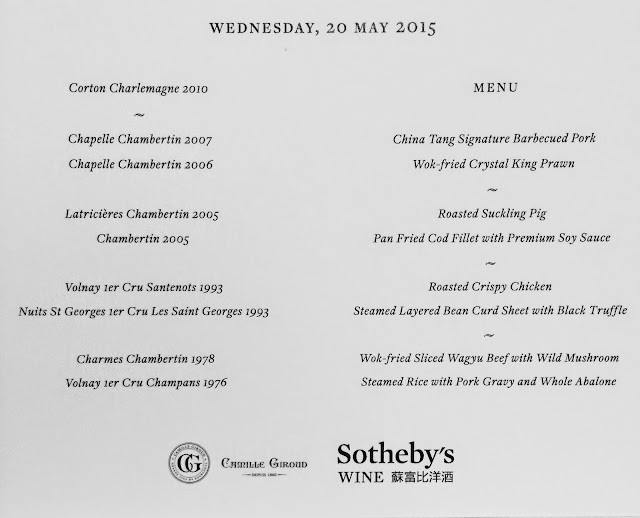 With another auction coming up, Sotheby's has once again very kindly extended an invitation for me to attend a dinner - this time featuring the wines from Maison Camille Giroud. There is a consignment direct from the maison, and winemaker David Croix was here to introduce the wines. To be honest, many of us don't come across Camille Giroud much. The two main reasons I myself have had some exposure is because I picked up a few bottles of their 1971 Clos Vougeot at auction a few years ago, which drank pretty well. Then a few years ago I found out that Ann Colgin and Joe Wender became part owners of the maison. Since Ann is one of my favorite winemakers around, I figured things could only be looking up. What I didn't realize was that Camille Giroud is a negociant, and they don't have any vineyard holdings of their own. So the wines they make would change over time, depending on the grapes they buy. Some of the wines from their 30-odd offerings are only made in as little as 3 barrels or so. 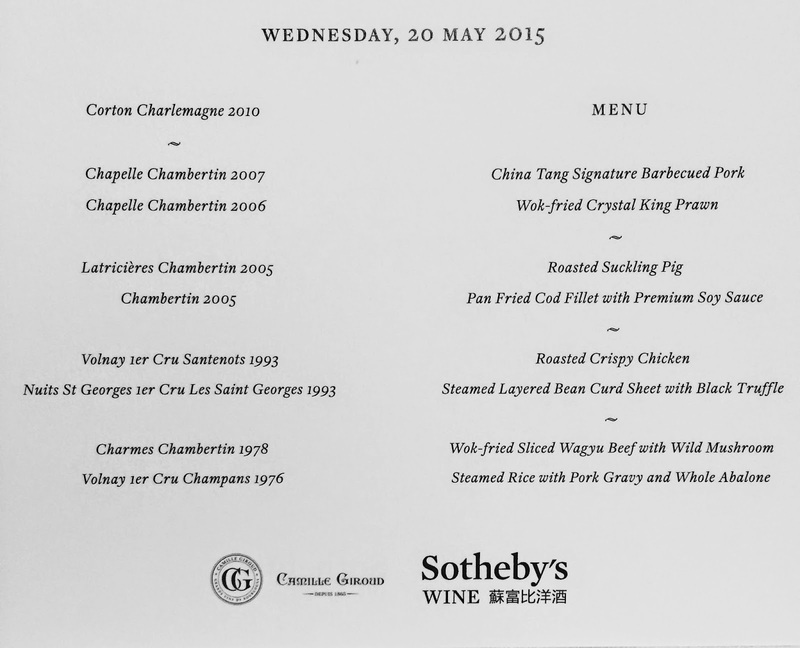 Because this was a more "intimate" gathering, Sotheby's chose to host it at China Tang (唐人館). I've only been to China Tang once, so this was a nice opportunity to revisit the cuisine here. China Tang signature barbecued pork (唐人館叉燒) - very curious. Instead of the usual honey-glazed version, which includes one of my all-time favorite versions at Island Tang (港島廰), this actually came with a hint of black pepper. While there was some fat here, the lean part was a little too dry and tough for my liking. Wok-fried crystal king prawn (水晶蝦球) - a Cantonese classic and a premium item. This was OK.
Roasted suckling pig (乳豬件) - this was also OK.
Pan fried cod fillets with premium soy sauce (煎封鱈魚球) - pretty good. I like cod for its soft and succulent texture. When you pan-fry so that the exterior becomes crispy and seal in the juices, the result can be pretty damn good. Roasted crispy chicken (龍崗炸子雞) - very tender, with classic, paper-thin skin. Steamed layered bean curd sheet with black truffle (黑松露千層腐皮) - pretty nice millefeuille. Wok-fried sliced wagyu beef with wild mushroom and Chinese yam (野山菌炒和牛片) - my least favorite dish of the evening. Totally boring in terms of flavor when you overcook beef, and I didn't even think the beef was that good to begin with. Steamed rice with pork gravy and whole abalone (原隻鮑魚滷肉飯) - this was kinda interesting. Rice with pork gravy (滷肉飯) is a well-known Taiwanese staple, and a bowl at my favorite restaurant chain will cost less than 1 USD. Here they've decided to make a premium version by adding abalone in addition to the finely diced pork fat and skin. Well, delicious it may be, but in my experience abalone always clashes horribly with red wine - as the latter can't help but bring out the intense "fishy" flavors of the shellfish - making the combination a little unpleasant for me. Two little bites of petits fours: mini fried sesame ball (煎堆) with sweet filling. Steamed dark sugar cane honey sponge cake (蜂蜜黑糖糕) is a perennial favorite of mine, and I can never have enough of this. David told us that Camille Giroud has always made wines which were meant to age for a long time, and he very kindly brought along a very nice lineup of wines spanning 4 decades to show us how the wines would evolve. This would prove to be a pretty education tasting. 2010 Camille Giroud Corton-Charlemagne en magnum - nice but still a little closed. A little smoke, some lemon notes, fragrant, and a little ripe. This sees very little new oak. Opened up after an hour and was nice and buttery. First flight: David wanted to show us two different vintages of the same wine, and these were pretty different. Popped and poured. 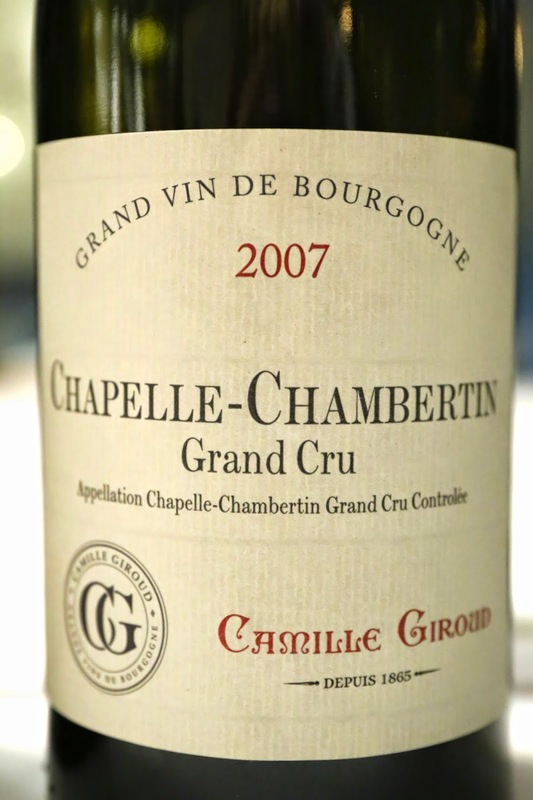 2007 Camille Giroud Chapelle-Chambertin - very lovely fruit, with black cherries and almost a little bit of strawberries. A little leather on the nose, and eucalyptus, and lots of forest pine. 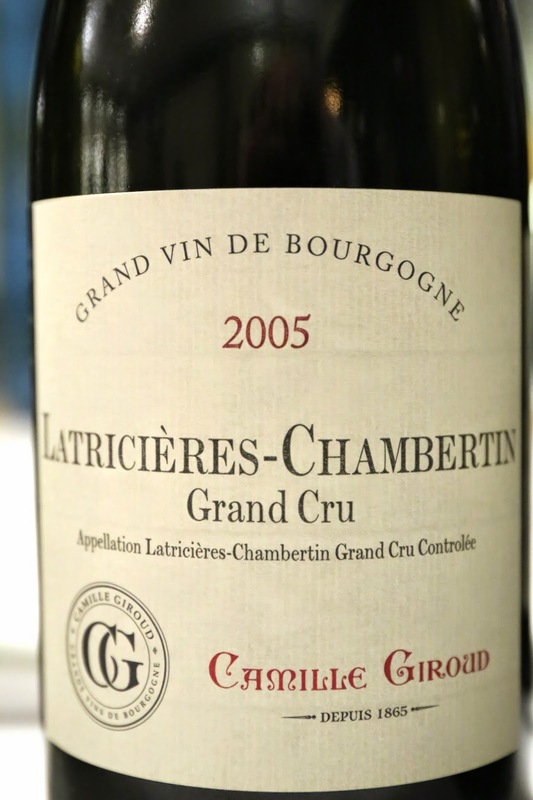 Ripe and concentrated, with good tannins, but pretty forward and accessible. 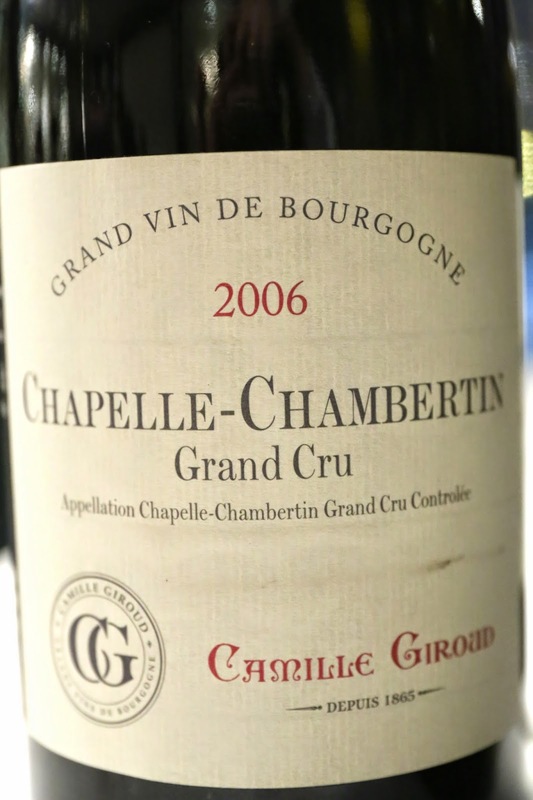 2006 Camille Giroud Chapelle-Chambertin - could this be only one year younger than the 2007? Seemed much softer with very nice red fruits. Nice and open nose full of bacon fat, and a whiff of savory notes. Second flight: double-decanted for more than 2 hours prior to serving. Definitely necessary for a big vintage like this. 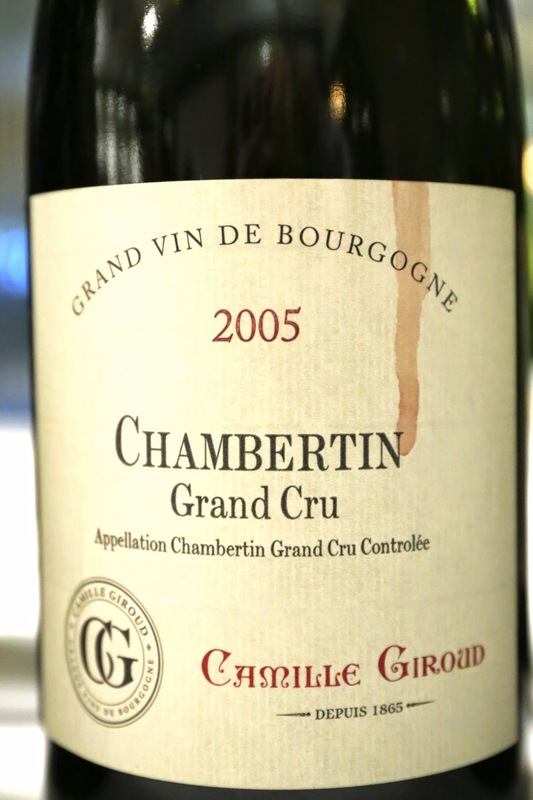 2005 Camille Giroud Chambertin - the nose was still a little closed at first, and there were still plenty of tannins. Just too young. Third flight: two decades older, and much more ready and enjoyable. 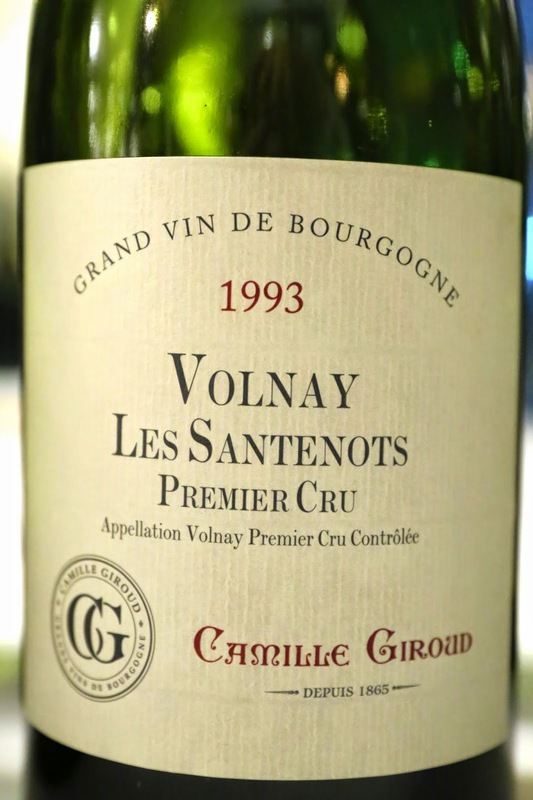 1993 Camille Giroud Volnay 1er Cru Les Santenots - some green grass on the nose, with leather, farmy notes. A slight hint of stinkiness... Nice acidity here. 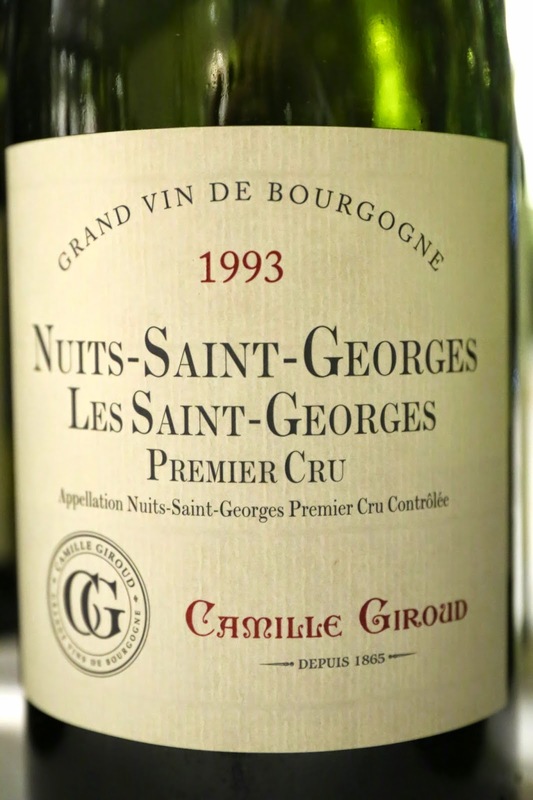 1993 Camille Giroud Nuits-Saint-Georges 1er Cru Les Saint-Georges - nice and ripe, with sweet fruit. Ready to drink now but there are still noticeable tannins here. More enjoyable than the Volnay. Fourth flight: almost four decades-old. Definitely ready and very much enjoyable now. 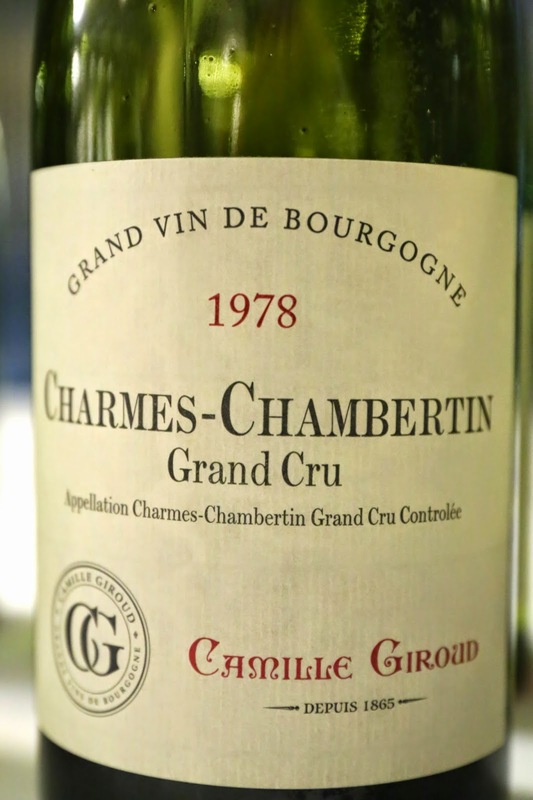 1978 Camille Giroud Charmes-Chambertin - a little more concentrated on the palate, with sweeter fruit. Very lovely and unquestionably the wine of the evening. 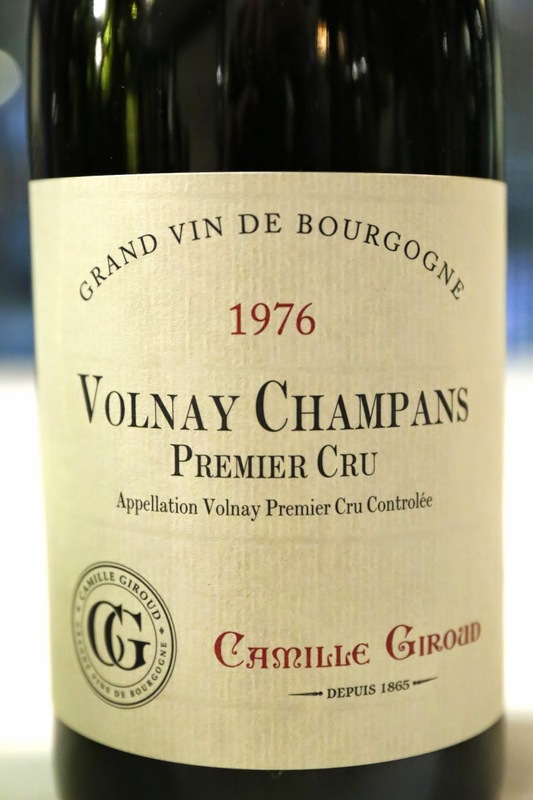 1976 Camille Giroud Volnay 1er Cru Champans - very smooth on the palace, with a nice balance. A hint of sweet grass in the nose on top of the fruit.